About 5 years back, I decided to try my hand at learning art. In one of the evening art classes at St Albans, Elisa introduced me to lino-cutting tools and that was it! Just the act of cutting away bits of lino to create an image was fascinating. It led to my exploring the medium in greater depth at the University of Hertfordshire and subsequently at Curwen Study Centre in Cambridge. I like to use bold colours and find that the art of printmaking allows me to experiment and create images that push the boundary. Here’s an example of an image of Cuilin mountains that was inspired by my holiday in the Isle of Skye in October 2013. 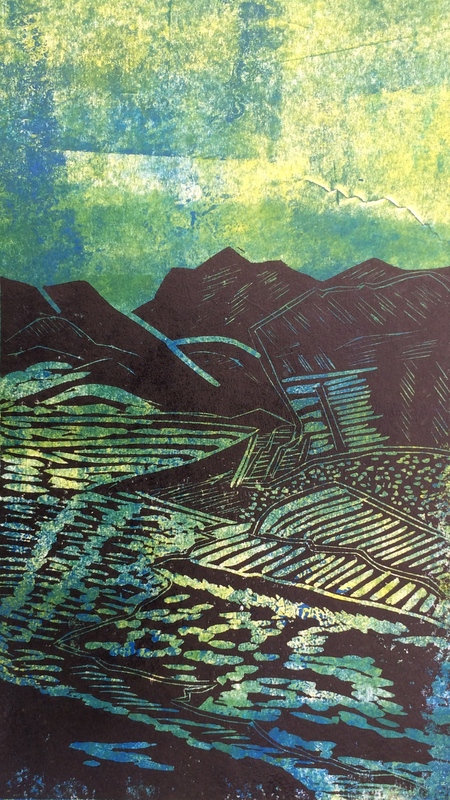 This piece uses two techniques – a mono print on paper overlayed with a lino cut image. While I find that I can never really capture, on a photograph or a painting, the magic of what I see with my own eyes, just the process of trying to create something that appeals to me based on what I see, is very satisfying. Here’s another – this one is a unique piece too. It uses the method of hand done screen printing with three layers of colour. I find the symmetry in architecture very inspiring! In this screen print of the London Eye, I tried to create a sense of movement by using loose brush strokes on the silk screen, for the image of the wheel. It is one of my favourite pieces and am very happy that one of my customers is enjoying the piece of art as much as I enjoyed creating it. I continue to explore the medium and in these pages have tried to share not just my work but also my views on art I see everyday, and in some amazing galleries around the world. Hi mala itis lovely! Send more!